Windsor State Forest is a victim of politicians and the Massachusetts' budget. The park used to have a popular day-use area and campground, but both have been closed for several years now. The roads within the park are still nicely maintained, and so visiting the large gorge and cascading waters at Windsor Jambs is still a popular thing to do. Although the gorge is significant and the brook can be very powerful, especially in the springtime, Windsor Jambs' natural beauty lies somewhat constrained by a fence that surrounds the entire ridge along the edge of the gorge. The Jambs, as they are also known, receive very little sun. Unobstructed views of cascades can really only be seen from the upper end of the gorge, unless perhaps if you visit in early spring before leaves begin to grow. 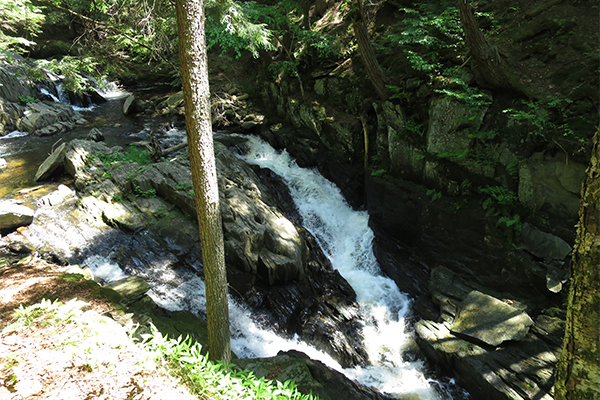 From the parking area, follow the blue-blazed trail that heads downstream along the edge of large gorge surrounding Windsor Jambs Brook. 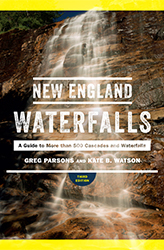 The most visible falls are at the head of the gorge, and are only 100 feet or so from the trailhead. If you continue descending for 0.2 mile along the fenced-in edge of the gorge you will have limited views of more cascades within the gorge. At the end of the gorge, the trail will provide direct access to the brook. It is difficult but possible to then wade upstream into the gorge a fair distance. You will absolutely get wet and the rocks are extremely slippery in the brook and along its edge, so take caution if you try this. From the junction of MA 9 and US-7 in Pittsfield, take MA 9 east. Continue traveling on MA 9 east as MA 8a joins with, and later splits off from, MA 9. Continue traveling on MA 9 east for 4.0 miles beyond where MA 8a splits away and heads north towards Savoy and take a left onto W. Main St. W. Main St is 0.6 mile east of the "Entering Cummington" sign on MA 9. After driving 0.1 mile on W. Main St, take a left onto River Rd. Follow River Rd for 2.9 miles (bearing right at a fork after 1.9 miles to stay on the road) and when you see a large but closed parking area on the left, you need to take a right onto Lower Rd, a nicely-maintained dirt road. Travel on Lower Rd for 0.6 mile, going straight through an intersection with Windigo Rd at 0.3 mile. At the end of the 0.6 mile, you will see a sign pointing right for the "Jambs". Take a right here onto Schoolhouse Rd and the large parking area for the falls will be 0.1 mile up the road on the right. You can also reach Windsor Jambs from the combined highway MA 8A & MA 116 to the north. Take (the paved) River Rd south for 3.0 miles and turn left onto Lower Rd. Follow the directions above to get from Lower Rd to the trailhead.